PARKVILLE – From the nation’s first cathedral to the carpeted floor of a church just inside the Baltimore Beltway, day one of the Pilgrimage of Love and Mercy felt like the parable of the loaves and fishes. 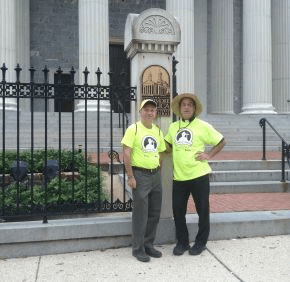 Whenever a need arose Sept. 20, it was filled for the 20 men, women and teens who began a 108-mile walk to Philadelphia, where Pope Francis will celebrate a public Mass Sept. 27. We began at the Basilica of the National Shrine of the Assumption of the Blessed Virgin Mary in Baltimore, where Father John “Jack” Lombardi celebrated 10:45 a.m. Mass – but not after blessing 100 Hispanic women on their own pilgrimage, for immigration rights, from York, Pa., to Washington, D.C.
“Difficult times push us higher,” Father Lombardi said in his homily. Lunch at the Catholic Center was provided by the Church of the Nativity in Timonium. Our first prayer stop was at St. Ignatius Church on Calvert Street, where Father James Casciotti, the new pastor, had donated the use of a 15-passenger van for the entire pilgrimage. He gave us his blessing. From there it was on to the offices of Catholic Review Media, the co-sponsor of the pilgrimage, along with the Archdiocese of Baltimore. Making our way up Charles Street, we paused in front of the headquarters of the St. Vincent de Paul Society of Baltimore; its chaplain is Father Lombardi. St. James being the patron of pilgrims, we enjoyed a break and blessing at Ss. Philip and James Parish, courtesy of Dominican Father Dominic Bump. Next Sunday, he’ll take two busses of parishioners and Johns Hopkins University students to the papal Mass in Philadelphia. “Feet for Francis” prayer cards, using the motto of the shoe drive for charity that complements the pilgrimage, were distributed along the way, including at Marian House, a women’s shelter sponsored by several orders of religious women. Paula Tiller, a mother of 10 and parishioner of Father Lombardi’s at St. Peter in Hancock, helped lead us up Loch Raven Boulevard, followed by her two youngest sons, and youngest daughter, Philomena, 9. Her husband, Paul, served as a van support driver, along with Pat and Laura Hamilton, parishioners of St. Agnes, Catonsville. We needed a mid-afternoon respite, and found one at St. Matthew Parish in Northwood, courtesy of Mercy High School staffers Becky Hogg and Pat Fannon. Mercy students donated assorted snacks, which were placed into bags by Hogg and her 5-year-old daughter, Margot. Immaculate Heart of Mary in Baynesville offered another pit stop. Walking east on Putty Hill Avenue, the setting sun cast a warm glow on St. Ursula in the distance. We arrived there at 7 p.m., after walking 11.9 miles. Father Steve Hook, pastor, Deacon Mike Baxter and friends provided dinner. The core group of through-walkers was joined for the day by St. Ursula parishioner Jim Webbert, whose son, Martin, 14, planned to walk only for the day but decided to join the entire journey. Casey Buckstaff, principal of St. John the Evangelist School in Severna Park, and Kathy Hamlett, her administrative assistant, also helped pace the pilgrimage for the day. Nearly 12 hours after they had arrived at the Basilica, pilgrims kneeled devoutly in St. Ursula Church, where Father Lombardi led a prayer service and eucharistic adoration. Sleeping bags lined the outer aisles, where many would bed down for the night and rest for day two, a 16.2-mile hike to The John Carroll School in Bel Air. Click here for ongoing local, national and international coverage of Pope Francis’ visit to America, including stories, Catholic Review blogs and commentary.